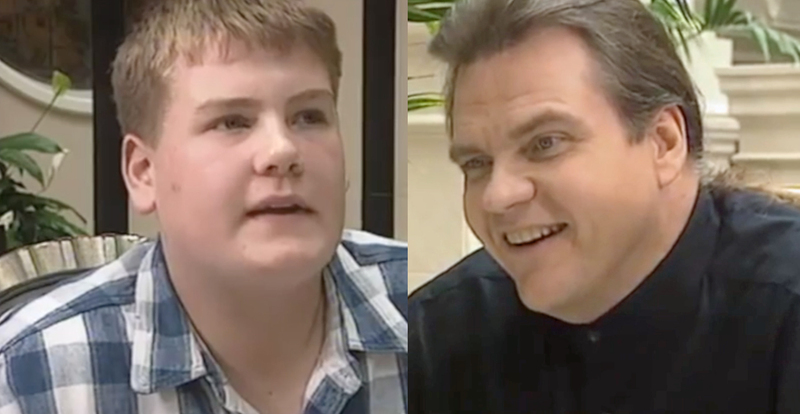 See the baby-faced star chat to the rock legend in this brilliant bit of archive TV. James Corden is a huge star in the US, but back here in the UK of course, we’ve known him for years. He spent the 90s playing bit parts in Hollyoaks and Teachers, before gaining fame with the much-loved Gavin And Stacey. But, long before he crossed the Atlantic to host The Late Late Show in Los Angeles, James was the “showbiz reporter” on - of all things - Good Morning With Anne And Nick. One of Corden’s assignments was to head out to a posh hotel and interview rock legend Meat Loaf over breakfast. And the segment is oddly charming. After some cheesy “business” with the doorman, where he pretends that he’s not sure whether he’s at the right hotel, James sits down with the Bat Out Of Hell star and a bit of mutual appreciation begins. After Mr Loaf literally bangs his head on the table at the thought of doing promotion for his new album, James asks the singer what keeps him going. Well, apparently he did… and took up acting and presenting in earnest.